Time for another game day! These things do come round very quickly, you’re right. 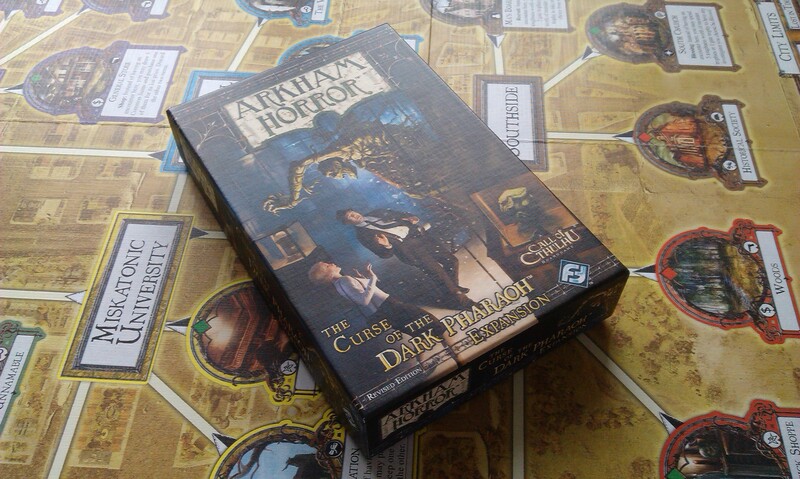 Today, I’m looking at another expansion for Arkham Horror – it’s Curse of the Dark Pharaoh! This was the first small-box expansion for the game, and so brings some more cards for the base game, as well as a whole load of small tweaks and little additions that add a great theme. 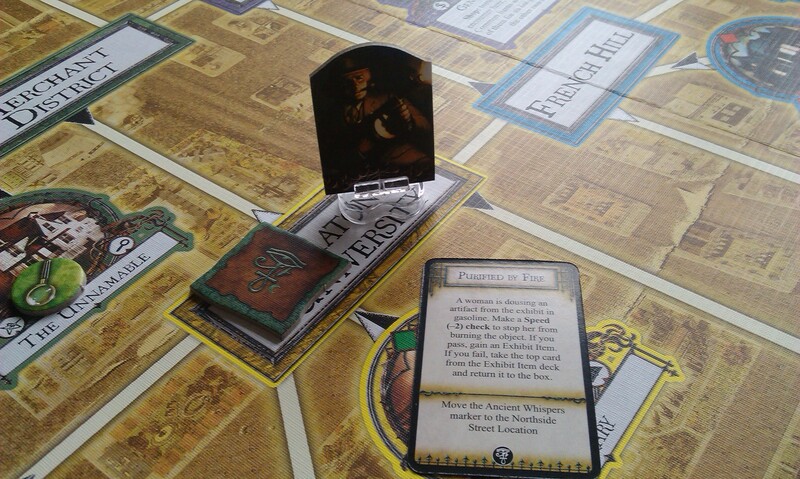 The basis for the game is that an exhibition has come to Arkham with some mystery surrounding the whole thing. The Dark Pharaoh, avatar of Nyarlathotep, is a pretty tough chap. He works perfectly well with Nyarlathotep, naturally, buffing that Ancient One during the final battle as well as the Mask monsters during the main game. Indeed, when you play with this Herald, you’re almost always going to want to be going up against the crawling chaos! The theme of the Pharaoh working against the investigators’ attempts to uncover the secret of the Exhibition can come across really well as the game progresses, which is really what the Heralds are all about. 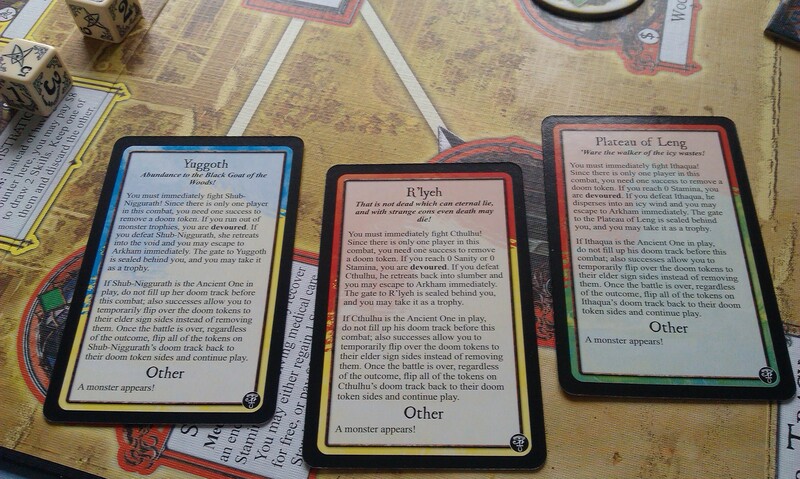 If you read my original blog on the base game, you’ll notice I didn’t mention these monsters, as they only work in the specific instance of going up against Nyarlathotep. They’re really just normal monsters, albeit ones that are very tough to beat, as they represent the many faces of the Ancient One. They all have the Endless ability, which means they’re never claimed as trophies once defeated, so you might run into them again later in the game. 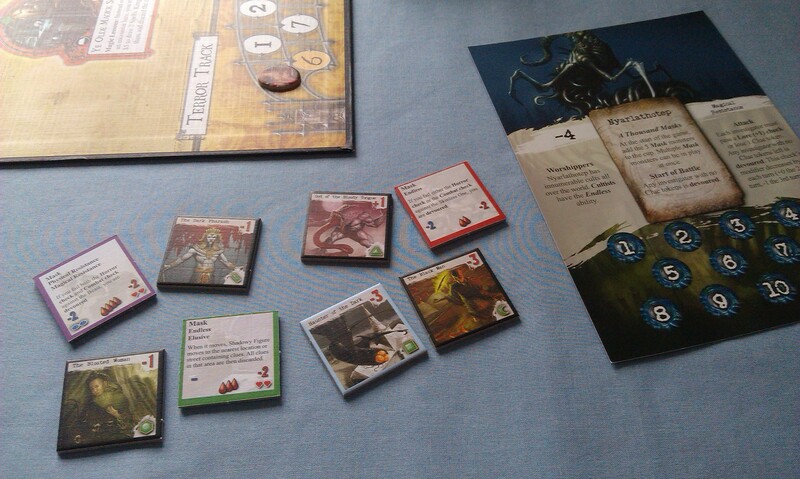 The base game comes with five, though subsequent expansions have included more so that the total is now eight. Anyway. These cards are really great, as they can lead to a truly epic game if you actually survive them. Indeed, a lot of the new cards in this expansion have some really epic moments, and some of them are just terrifyingly difficult to overcome, with penalties for failed skill checks including actually being devoured, rather than merely losing sanity or stamina, etc. It can produce some fairly tense moments, let me tell you! 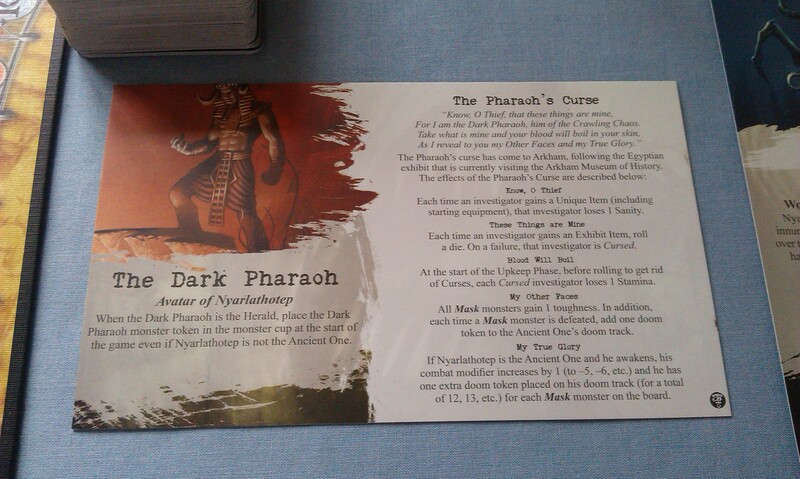 As the first expansion for the game, Curse of the Dark Pharaoh is perhaps understandably predominantly more of the same, with a new theme sprinkled on; subsequent small-box expansions would contain a much more pervasive theme (such as Lurker at the Threshold). However, it can still lead to a really great play experience, not least as a result of the revised version, which is the one I have. The biggest change is the randomly-moving marker that allows you to encounter the Exhibition. As stated above, this allows you to draw Exhibit Encounters that can potentially give you some really useful Exhibit Items, but it doesn’t stay still. In addition to the Exhibit Encounter cards moving it, it can also move as if it were a monster during the Mythos phase, so you can sometimes find yourself forced to encounter it. I’ve ended up cursed many times as a result of a forced encounter where I then failed the skill check. Definitely one to look out for! It’s a great little box, which I highly recommend if you have the base game and want something new but not overly complicated like a big box expansion. 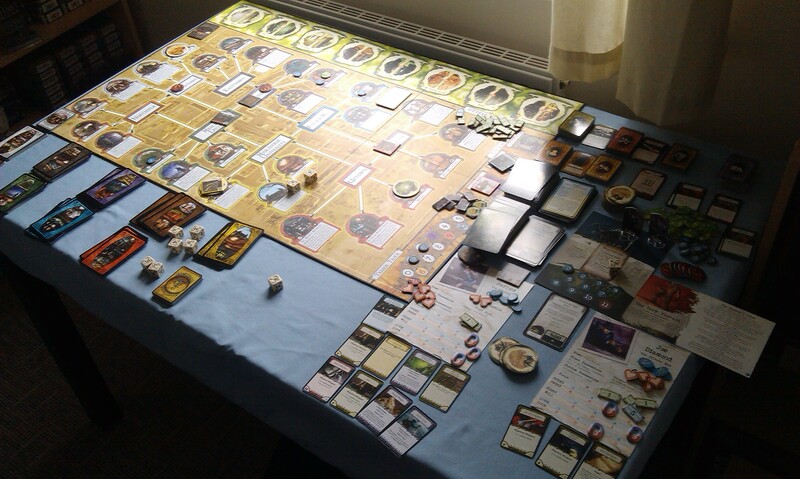 Author spalanzPosted on June 2, 2015 October 6, 2015 Categories board gamesTags Arkham Horror, Cthulhu, Fantasy Flight Games, game day, NyarlathotepLeave a comment on Cursed!